When you are getting ready to taste Geay oysters, they are well alive and vigorous. They will not uncover their secrets and aromas without resisting! 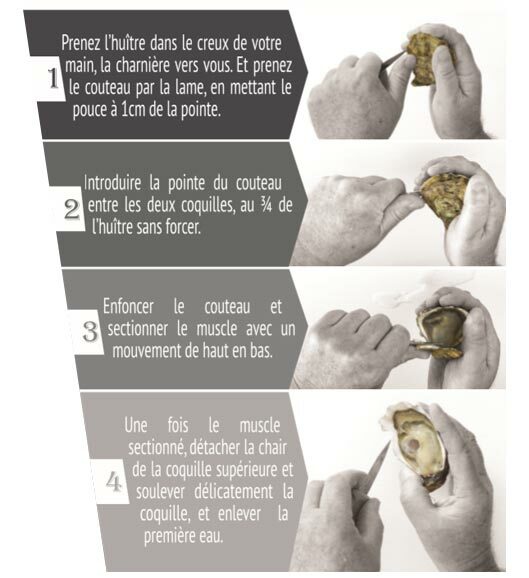 Take the oyster in the bottom of your hand with the hinge facing you. Hold the knife by the blade while keeping your thumb at 1 cm off the knife-edge. Introduce the edge of the knife between the shells at ¾ of the length of the oyster. Dig the knife and cut the muscle in a movement going from top to bottom. Once the muscle is cut, detach the flesh of the top shell and slowly lift the shell. Remove the water and bits of shells that may be inside and lay the oysters on a platter. If you are still unsure on how to do this, follow the indications in the pictures below .